What are you smoking Mr Gadkari (and can I have some)? Of all the topics covered in this blog, India’s highway construction programme attracts the most yawns from friends and family (and the least interest in social media). But apart from its intrinsic importance and the resonance that highway construction programmes have long had in discourses of modernity — think the New Deal and Hitler’s autobahns — it also offers a good advance indicator of a government’s project execution abilities. And the Modi model involves claims about effective execution, if nothing else. Which may be why the Modi government persists in making patently false claims about its record in this area. In a 19 May Business Standard interview, the roads and shipping minister Nitin Gadkari claimed that road construction had been “going on at a pace of two km/day” and “Today, it is 12 km/day.” His observant interviewers pointed out that his ministry’s own figures showed that the pace of road construction in 2013-14, before the Bharatiya Janata Party (BJP) came to power, had been 11.7 km/day, and was mostly unchanged at 12.1 km/day in 2014-15 under the BJP. 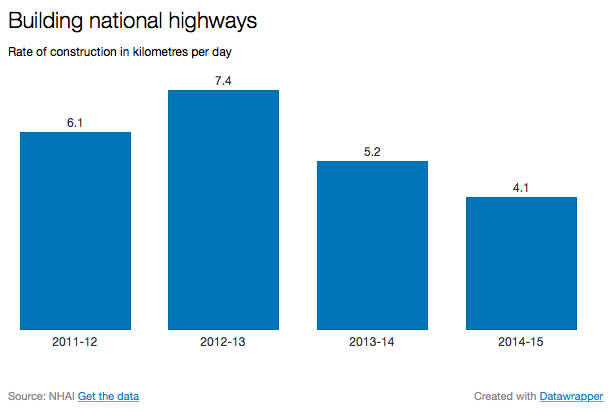 The pace of highway construction under the auspices of the National Highway Authority of India is the lowest in 2014-15, the first year of the Modi government. It would be perfectly reasonable for the government to argue that its policies will take time to deliver results on the ground, and that the current slowness in highway building is a legacy of decisions taken by the previous government. But that’s not what the government is saying: it is instead making false claims about its record that do not stand up to the most basic scrutiny. Do pass the chillum, Mr Gadkari. What’s your beef, Mr Naqvi? Well written Amitabh. Your analysis are v interesting.